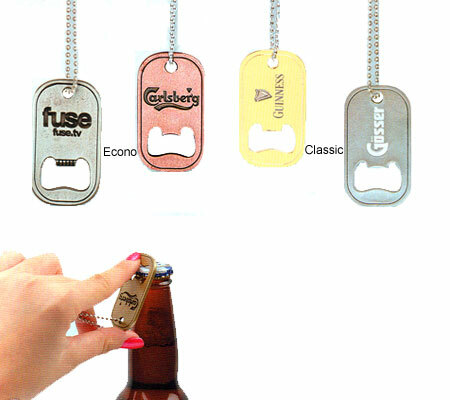 These Custom Dog Tag Bottle Openers can be custom molded with your company logo or design. Our Customized Dog Tag Bottle Openers feature two finishes, Classic and Econo. Each Custom Dog Tag Bottle Opener comes with a 24" silver ball chain. Convenient and easy to use, both of our Custom Dog Tag Bottle Openers make great promotional giveaways that recipients love to use.